Rain, sleet or snow, we’ve been hitting the Boulder County Farmers Market every Saturday. Why even bother on a snowy Saturday? Because you only get a short window for asparagus, and come hell or high water, we’re not going to miss it. Human nature is quirky—we treasure what is hard to come by or can only be enjoyed fleetingly. Thus, our love of asparagus. This perennial bulb and stem vegetable can take up to three growing seasons to reach maturity. Plus, harvesting season only lasts for two to three weeks, making seasonal asparagus a food in short supply and high demand. So hit the market while supplies last, and head straight for Kiowa Valley Organics‘ stand. 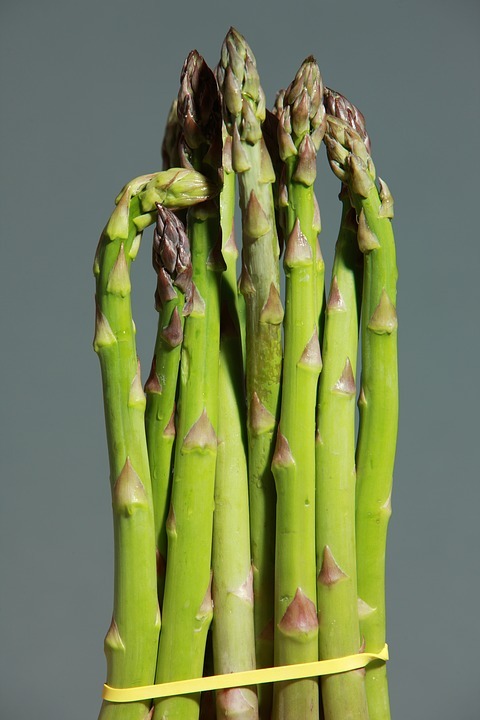 A new vendor at the Boulder Farmers Market, this Roggen-based organic grower boasts bundles of asparagus harvested at the peak of flavor from their 15-acre organic asparagus field. But hurry—Kiowa wraps up their asparagus harvesting in June. Once you’ve got your goods, it’s time to get down to business in the kitchen. There are endless ways to incorporate asparagus into your weekly menu, either as the star of the dish, or as best supporting ingredient. Chef Jim’s new recipe for a Spring Asparagus Risotto is the perfect way to celebrate the flavors of the season. Yes, you read that correctly. Spring risotto. Though risotto is typically considered a dense dish served most appropriately in colder months, risotto lovers don’t have to do without when spring arrives. Try Chef Jim’s incredibly light and fresh take on the classic dish—you’ll thank us, we promise. 1. Cut off tough ends of asparagus, about 1 ½ inches from the bottom. Reserve upper stalks. 2. Place tough ends in 2 quarts of cold water and bring to a boil. Reduce heat and simmer for 10-15 min. 3. Remove and discard the asparagus ends and reserve the cooking liquid. Check the liquid for any grit that may have settled at the bottom of the pan, and strain or pour off into another pan if necessary. 4. Cut reserved asparagus stalks into 1/2 – 3/4 inch pieces, reserving the tips. 5. Bring reserved cooking liquid to a boil and add cut asparagus pieces (reserve the tips). Cook until firm tender, about 5 min. Remove the asparagus pieces with a slotted spoon and chill under cold water or in an ice bath. Continue cooking the liquid at a low simmer. 6. Divide chilled asparagus into 2 small bowls. In a food processor, combine one of the two bowls of asparagus with 2 tbsp. grated parmesan, lemon zest, parsley, 2 tbsp. olive oil, salt and pepper to taste. Pulse the mixture into a course puree and place back in a small bowl. 7. In a large saucepan over medium heat, cook onion in 2 tbsp. olive oil until just tender. Stir in rice and cook for another 3-4 minutes, stirring to coat and toast the rice ever so slightly. 8. Add 1/4 cup of wine and stir until wine evaporates. Continue stirring and gradually ladle the hot cooking liquid one cup at a time, letting liquid absorb into the rice before adding more liquid. Before adding the last of the cooking liquid, stir in pureed asparagus, 2 tbsp. of butter, 2 tbsp. grated parmesan, the other small bowl of cooked asparagus and reserved, uncooked asparagus tips. 9. Taste the risotto and add salt and pepper to taste. Rice should be slightly al dente. Ladle in the last bit of the cooking liquid. Serve the risotto in warm, shallow bowls. Garnish with grated parmesan and minced parsley. What makes this risotto unique is its lightness and texture. Unlike typical risottos, this recipe doesn’t call for stock and requires only small amounts of fats, making it less rich and highlighting the fresh flavor of the asparagus. And adding asparagus in a variety of forms in this recipe means that this risotto has texture all over the place—the crunchy asparagus pieces complement the asparagus puree that forms the base of this risotto.